Socket for eMMC NAND adapter - MR TYPE 1 PINOUT 1 is pinout for the eMMC NAND adapter that allowing to configure the MR adapter for the selected eMMC memory model. The product is available only to owners of the MR TYPE 1 adapter - when ordering, the serial number of the adapter will be required (the number is located on the adapter housing). 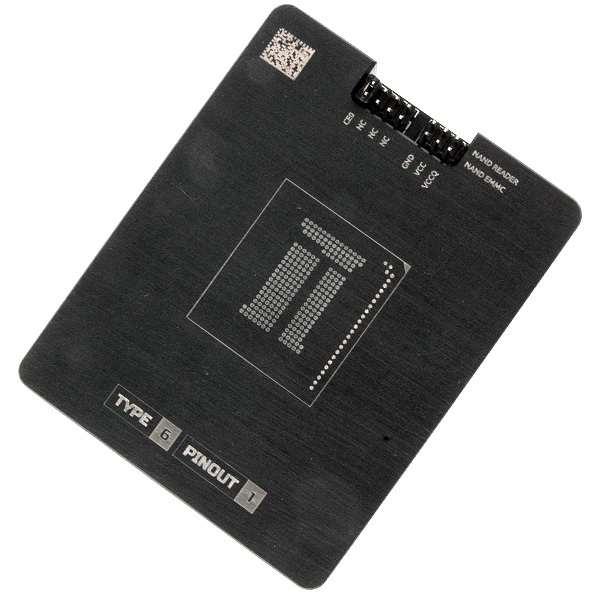 Socket for eMMC NAND adapter - MR TYPE 1 PINOUT 2 is pinout for the eMMC NAND adapter that allowing to configure the MR adapter for the selected eMMC memory model. The product is available only to owners of the MR TYPE 1 adapter - when ordering, the serial number of the adapter will be required (the number is located on the adapter housing). Socket for eMMC NAND adapter - MR TYPE 10 PINOUT 1 is pinout for the eMMC NAND adapter that allowing to configure the MR adapter for the selected eMMC memory model. The product is available only to owners of the MR TYPE 10 adapter - when ordering, the serial number of the adapter will be required (the number is located on the adapter housing). 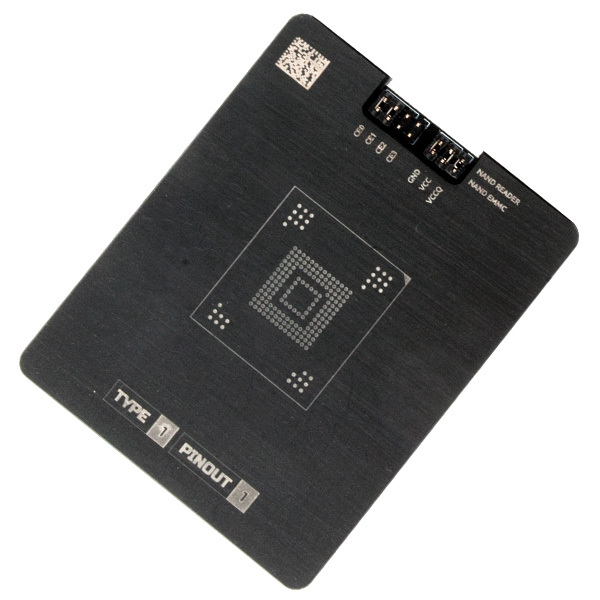 Socket for eMMC NAND adapter - MR TYPE 10 PINOUT 2 is pinout for the eMMC NAND adapter that allowing to configure the MR adapter for the selected eMMC memory model. The product is available only to owners of the MR TYPE 10 adapter - when ordering, the serial number of the adapter will be required (the number is located on the adapter housing). Socket for eMMC NAND adapter - MR TYPE 11 PINOUT 1 is pinout for the eMMC NAND adapter that allowing to configure the MR adapter for the selected eMMC memory model. The product is available only to owners of the MR TYPE 11 adapter - when ordering, the serial number of the adapter will be required (the number is located on the adapter housing). Socket for eMMC NAND adapter - MR TYPE 11 PINOUT 2 is pinout for the eMMC NAND adapter that allowing to configure the MR adapter for the selected eMMC memory model. The product is available only to owners of the MR TYPE 11 adapter - when ordering, the serial number of the adapter will be required (the number is located on the adapter housing). Socket for eMMC NAND adapter - MR TYPE 12 PINOUT 1 is pinout for the eMMC NAND adapter that allowing to configure the MR adapter for the selected eMMC memory model. The product is available only to owners of the MR TYPE 12 adapter - when ordering, the serial number of the adapter will be required (the number is located on the adapter housing). Socket for eMMC NAND adapter - MR TYPE 2 PINOUT 1 is pinout for the eMMC NAND adapter that allowing to configure the MR adapter for the selected eMMC memory model. The product is available only to owners of the MR TYPE 2 adapter - when ordering, the serial number of the adapter will be required (the number is located on the adapter housing). Socket for eMMC NAND adapter - MR TYPE 2 PINOUT 2 is pinout for the eMMC NAND adapter that allowing to configure the MR adapter for the selected eMMC memory model. The product is available only to owners of the MR TYPE 2 adapter - when ordering, the serial number of the adapter will be required (the number is located on the adapter housing). Socket for eMMC NAND adapter - MR TYPE 2 PINOUT 3 is pinout for the eMMC NAND adapter that allowing to configure the MR adapter for the selected eMMC memory model. The product is available only to owners of the MR TYPE 2 adapter - when ordering, the serial number of the adapter will be required (the number is located on the adapter housing). Socket for eMMC NAND adapter - MR TYPE 3 PINOUT 1 is pinout for the eMMC NAND adapter that allowing to configure the MR adapter for the selected eMMC memory model. The product is available only to owners of the MR TYPE 3 adapter - when ordering, the serial number of the adapter will be required (the number is located on the adapter housing). Socket for eMMC NAND adapter - MR TYPE 4 PINOUT 1 is pinout for the eMMC NAND adapter that allowing to configure the MR adapter for the selected eMMC memory model. The product is available only to owners of the MR TYPE 4 adapter - when ordering, the serial number of the adapter will be required (the number is located on the adapter housing). Socket for eMMC NAND adapter - MR TYPE 5 PINOUT 1 is pinout for the eMMC NAND adapter that allowing to configure the MR adapter for the selected eMMC memory model. The product is available only to owners of the MR TYPE 5 adapter - when ordering, the serial number of the adapter will be required (the number is located on the adapter housing). Socket for eMMC NAND adapter - MR TYPE 5 PINOUT 2 is pinout for the eMMC NAND adapter that allowing to configure the MR adapter for the selected eMMC memory model. The product is available only to owners of the MR TYPE 5 adapter - when ordering, the serial number of the adapter will be required (the number is located on the adapter housing). Socket for eMMC NAND adapter - MR TYPE 6 PINOUT 1 is pinout for the eMMC NAND adapter that allowing to configure the MR adapter for the selected eMMC memory model. The product is available only to owners of the MR TYPE 6 adapter - when ordering, the serial number of the adapter will be required (the number is located on the adapter housing).